Chasing rabbits with dogs is a rewarding experience, but not everyone owns, or knows someone who owns, rabbit dogs. However, hunters can be successful without dogs if they hunt in the right places. To find those places, keep two things in mind. First, every air-breathing predator in North America pursues rabbits. Second, cottontails are one of the few true rabbits in the world that don’t dig their own warrens. This means cottontails are extremely dependent on dense, brushy, cover — vegetation that protects them from hawks and owls overhead and is dense enough that coyotes, foxes and bobcats have trouble moving through it. Hunters without dogs need to find thick early successional cover interspersed with grassy areas that contain a variety of food sources. Typically, large amounts of cover that protect rabbits also have abundant food. But attractive food close to the edge of cover increases the chances that rabbits will come into openings. Cottontails like thorny cover, such as briers, blackberries and raspberries, though they will use any cover that is thick. They do not hibernate, so ideal cover includes woody vegetation or substantial brush piles that provide cover all winter. Cutovers that have grown up in briers or other brush are ideal. Any thick areas that hunters typically avoid walking through contain rabbits. One tip for scouting a cutover is that if there is a high density of rabbits around, the flat tops of stumps in the cutover will have rabbit droppings on them. Rabbits are most active at dawn and dusk. One solo tactic is to set up at dusk or dawn with a .22 rifle in a position that allows you to see rabbits that come to the edge of thick cover to eat high-value food, such as clover, forbs or native grasses. If the landscape allows you to move without the rabbits seeing you, you can also modify this approach to include spot and stalking. But the classic method of solo rabbit hunting is to focus on small patches of cover — wood piles, hedgerows, clumps of briers that are slightly separated from other cover — and attempt to “stomp” the rabbits out of the cover. This kind of hunting requires alertness and quick shooting. 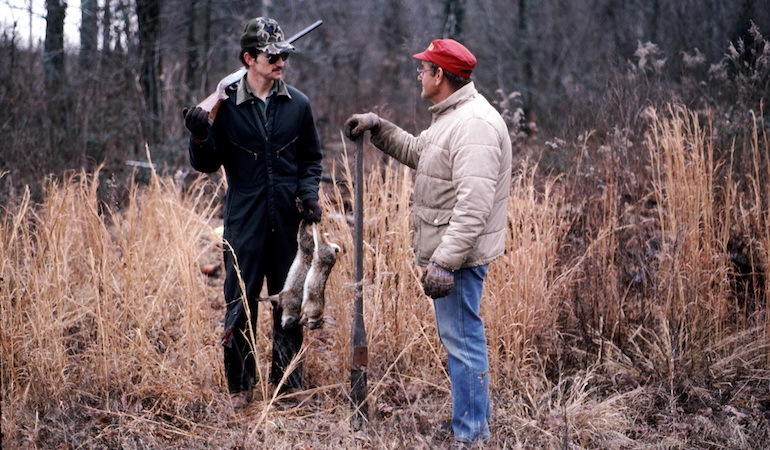 Most two- or three-man rabbit hunting is similar to solo hunting, but can be more effective, because one designated hunter can bust the brush while the others position themselves to get a shot at any rabbit trying to escape. By far the most important aspect of this kind of hunting has to do with safety. Always know where your partners are, and stay focused on muzzle control. Communicate with partners, making a plan for each section of brush and don’t change positions without letting your partners know. Ideally, the person stomping the brush is making enough noise that rabbits will leave it to avoid the commotion. Obvious escape routes include narrow openings between the far edge of the cover being pushed and the next patch of cover, or the end of a hedgerow or brushy fence line. Scouting to find a lot of these smaller areas can pay off for many years, because good cover is likely to produce good rabbit hunting for a few years — or more if the cover is managed.